This year’s RAPID Conference and Exposition is underway. And of course, the AMazing team is on the ground at RAPID. We are excited to attend this special event and hearing this year’s RAPID will surpass all previous attendance records. AutoDesk has released the Print Studio Ember design file. The file is open source with downloadable CAD files and resin recipes. Also, the Fusion 360 cloud based 3D CAD/CAM platform is free for students. 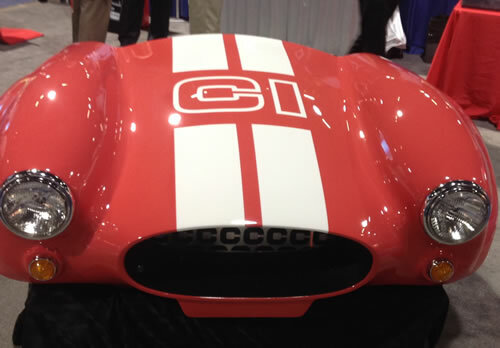 Cincinnati Incorporated is displaying the front end of an additively manufactured Shelby Cobra. The actual build took one day. The front end was then finished and painted. Really nice! Concept Laser is showcasing the company’s M2 cusing Multilaser Metal Additive Manufacturing System. The M2 is equipped with a single and multi laser system. The Multilaser option utilizes two 400 W lasers. The M2 is equipped with a new filter design that is five times larger but the overall machine footprint is smaller. Cosine Additive is exhibiting the company’s AM-1 Additive Manufacturing Machine. This is the first introduction of the FFF AM machine in a tradeshow. The AM-1 features a print volume of 43” x 34” x 37” (31.2 cut ft). DDM Systems-Fascinating lamp process for additively manufacturing cores for investment casting. The company is also touting the SLE™ Scanning Laser Epitaxy for laser additive manufacturing and re-manufacturing of high value components in conventionally non-weldable high-temperature alloys. FARO is exhibiting the FARO® HD laser scanner, which is adept at handling reflective material and with faster data collection. LPW Technology The company markets an online software package called POWDERSOLVE™ providing life-cycle tracking of the user’s additive manufacturing powders. Matsuura/M.C. 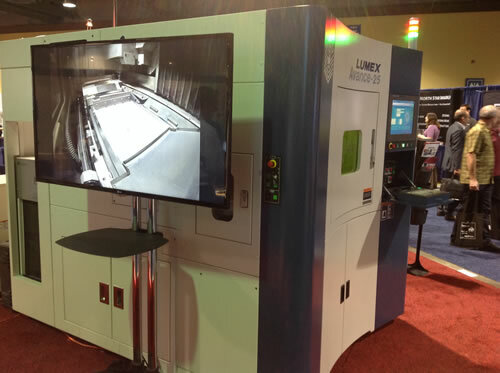 Machinery Systems Inc. is exhibiting the Lumex Avance-25 4th generation metal laser sintering hybrid milling machine. Mcor is introducing the Mcor IRIS HD, which provides 360° high-definition color, sharpens details, and reduces the industry’s already lowest operating costs by 20 percent. OPTOMEC-The company can upgrade any CNC tool machine with additive LENS technology. RapidScan3d is showcasing the hand held Artec Space Spider 3D scanner for light structural scanning, originally developed to work in space. Sciaky Inc.- The company is featuring an expanded lineup of EBAM 3D printing systems that includes new options for medium, large, and extra-large part applications, making EBAM the most widely scalable metal 3D printing solution on the market (in terms of work envelope) for parts ranging from 12 inches (305 mm) to 19 feet (5791 mm) in length. EBAM is also the fastest deposition process in the metal 3D printing market, based on documented deposition rates ranging from 7 to 20 lbs. (pounds) of metal per hour. SCICON is showcasing a simulated charging station to demonstrate the company’s ability to produce short run production of fully finished, assembled urethane products. SLM Solutions talked about the company’s flagship SLM500HL and the first time the machine has been featured in a US tradeshow. SMARTECHMARKETS Publishing is introducing a new “3D Printing in Dentistry” report. Smooth-On-Late last year, Smooth-On unveiled XTC-3D®, a brush-on coating for 3D printed parts. We couldn’t help but notice the advertisement for a UreCoat® brush-on flexible rubber coating. Another new product from Smooth-On! UL-It’s an exciting time as UL LLC and the University of Louisville launch a 3D printing training facility called the UL Additive Manufacturing Competency Center (UL AMCC). Voxel8 demonstrated the famous Voxel8 3D Printed quadcopter and a 3D printed antenna. The company claims the 3D printed antennae works better than the off-the-shelf product. The base is PLA with conductive ink. Wow! America Makes, Lockheed Martin and Wolf Robotics in a joint partnership, are displaying a Multi Robotic Additive Cluster System; incorporating several automated manufacturing operations in a coordinated manufacturing cluster including additive manufacturing, subtractive machining, process monitoring, visual inspection and thermal imaging measurements. This entry was posted in News and tagged AMazing®, Autodesk, Cincinnati Incorporated, Concept Laser, Cosine Additive, DDM Systems, FARO, LPW Technology, M.C. Machinery Systems Inc.-, Matsuura, Mcor, Optomec, RAPID, RapidScan3d, Sciaky Inc., SCICON, SMARTECHMARKETS Publishing, Smooth-On, UL, Voxel8 by david. Bookmark the permalink.